When you've been solely focused on central vacuums for over 50 years, you figure some things out; but don't take our word for it. Come see why MD Vacuum is the choice of thousands of homeowners who have provided over 25,000 reviews covering nearly every product we sell. Read reviews on a small coupling, a replacement hose, pet brush, or a complete replacement system. We offer the best products, at a great price, with excellent support. Our customer service team knows that their actions directly affect whether our customers are satisfied or not, and it keeps us at the top of our game. Compared to most of our competitors who only have a few, if any, real reviews, you'll see why we continue to be a top choice for homeowners and installers year after year. Check out our thousands of customer service reviews or start viewing our line of products and read our tens of thousands of product reviews! Hundreds of local dealers around the nation have installed hundreds of thousands of MD Central Vacuum Systems such as Silent Master, Modern Day, Flo-Master, and Air-Master. The local, independent dealer in your town can help you install a central vacuum in a new or existing home, retrofit a Hide-A-Hose, or perform service and repair. Our dealer locator allows you to see who they are, what they specialize in, and how others rate them. Visit our dealer locator and instantly have access to many dealers in your area! We have thousands of customers who clean with other popular central vacuum brands such as Beam, Vacuflo, and Nutone. These homeowners have improved the effectiveness of their systems by using our popular and durable vacuum replacements, hoses, and helpful accessories. Speaking of popular, this website contains over 10,000 answers to questions asked by people like you regarding every brand and possible concern a central vacuum can have. 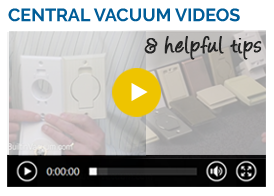 As you browse through our education pages or product page you will see "Q & A" on nearly every page. You can search the entire knowledge base for answers or ask a question yourself. We are happy to help! 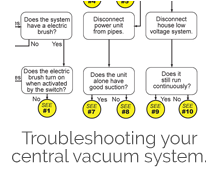 Come check out our general FAQ page for common answers to your questions or see our flow chart for answers to common troubleshooting problems.